Increase your intake of Vitamin K. This vitamin helps calcium adhere to bones to make them thicker. Vitamin K rich foods include broccoli, kale, and spinach. Don’t overdo it on the pillows. Your head should not be raised out of alignment with your spine. Also, hard mattresses may not be better for your back. Many people report that they feel less back pain when sleeping on a softer mattress. Do exercises to strengthen your abs. Strong abdominal muscles can help provide your spine with better support. Doing curls and pelvic tilts can increase your core strength. Carry a different bag. Your big Beverly Hills purchased bag may be fashionable, but, it can pull your body off balance if it’s too heavy. Opt for styles like messenger bags, which come on long straps that can be put across your body to balance the load. Improve your posture when sitting. Your back should be straight and your feet flat on the floor. Lumbar pillows can help maintain good posture. You can also try a balance ball to ensure that you don’t unconsciously slouch. 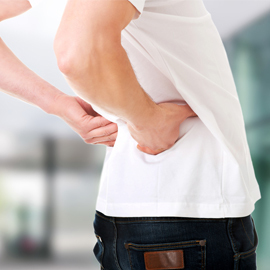 If after following these tips you are still experiencing a great deal of pain, contact your Beverly Hills center for health to find out what type of pain management therapy is best for your specific needs.